The MYA FREEZE hose has just made hookah smoking even cooler. 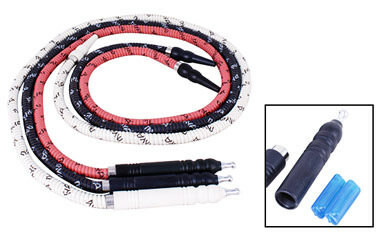 This wide gauge hose comes with two non-toxic freeze hose icicles that you put into the handle of the hose after freezing. Simply unscrew the handle, pop in a freeze pack, screw the handle back on and you're ready to go. Similar to putting ice into the vase, the idea behind the Mya Freeze hose is to cool down the smoke, which makes for a more pleasurable smoking experience. Need extra or replacement freeze icicles? We've got you covered. 72" MYA Freeze Hookah Hose has a average rating of 0 stars out of 5 stars based on 0 reviews.